In this week’s discussion of swine flu A/Mexico/09 (H1N1), we have considered many aspects of influenza virus biology that might not be familiar to some readers of virology blog. I thought it might be useful to explain how the virus multiplies, how it infects us, and how we combat infection. Today we’ll start with the basic structure of influenza virus, illustrated above. The influenza virion (as the infectious particle is called) is roughly spherical. It is an enveloped virus – that is, the outer layer is a lipid membrane which is taken from the host cell in which the virus multiplies. Inserted into the lipid membrane are ‘spikes’, which are proteins – actually glycoproteins, because they consist of protein linked to sugars – known as HA (hemagglutinin) and NA (neuraminidase). These are the proteins that determine the subtype of influenza virus (A/H1N1, for example). We’ll discuss later how the HA and NA are given subtype numbers. The HA and NA are important in the immune response against the virus; antibodies (proteins made by us to combat infection) against these spikes may protect against infection. The NA protein is the target of the antiviral drugs Relenza and Tamiflu. Also embedded in the lipid membrane is the M2 protein, which is the target of the antiviral adamantanes – amantadine and rimantadine. Beneath the lipid membrane is a viral protein called M1, or matrix protein. This protein, which forms a shell, gives strength and rigidity to the lipid envelope. Within the interior of the virion are the viral RNAs – 8 of them for influenza A viruses. These are the genetic material of the virus; they code for one or two proteins. Each RNA segment, as they are called, consists of RNA joined with several proteins shown in the diagram: B1, PB2, PA, NP. These RNA segments are the genes of influenza virus. The interior of the virion also contains another protein called NEP. This week, when we discussed the nucleotide sequence of swine influenza RNAs, we were referring to these RNA molecules. Tomorrow I’ll show you how each RNA codes for protein. This way it will be easier to understand the meaning of the swine flu virus sequences that were released this week. Let me know if this type of explanation is useful, and if you would like me to continue. Oh no, no, no, no, no!! Not “tomorrow”!! Where do I find the rest of this stuff??? This course is excellent. Virology has come a long way since I took my first virology course back in the dark ages. One question for the professor — do the people in your virology lab come down with more viral infections than the general population in NYC?. i apologize if my spelling is bad, but virus don’t really have a behavior, they are mostly just empty shells floating through and organism. they inject by molecular attractions and do not gain, use or produce energy, clearly showing that they are not dead… but are not classified as alive. What enables the virus to be spread as an aerosol? Versus a virus such as HIV? 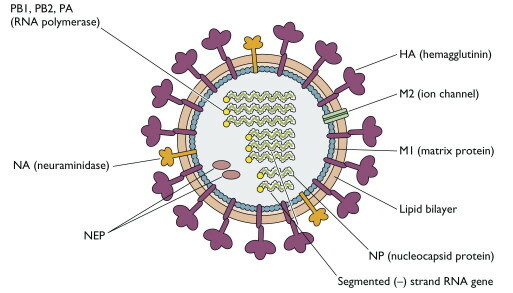 What does the virus mechanism look like before acquiring the lipid layer from the host cell? How do plants kill viruses? It does hint that they are not alive since they act only as smart bombs. But there is a chosen “behavior” predetermined by their HN shell. What is the structural difference between H1N1, H5N1and H7N2? How to differ H1N1 and H5N1 ?